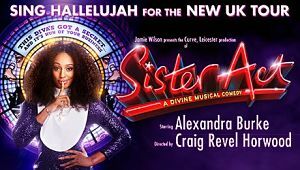 Musical Theatre News: Sister Act heading back to London? Sister Act heading back to London? Talking at a launch to promote the new film version of Beauty and the Beast legendary musical composer Alan Menken has said he expects Sister Act to head back into the West End soon. Saying: " Sister Act is coming back to the West End soon. The nuns play their own instruments!" Craig Revel Horwood's production is currently touring the UK until 3rd September with Alexandra Burke in the lead role.